BON JOVI performed on September 11, 2002 in Tokyo all the invitation live. Sapporo, Sendai, Nagoya, Osaka, Fukuoka at each venue was broadcasted satellite live tickets for Sapporo, unused. In Sapporo, 300 people were invited from lottery among album BOUNCE reserved people. The 2nd image is a note sent with the ticket. 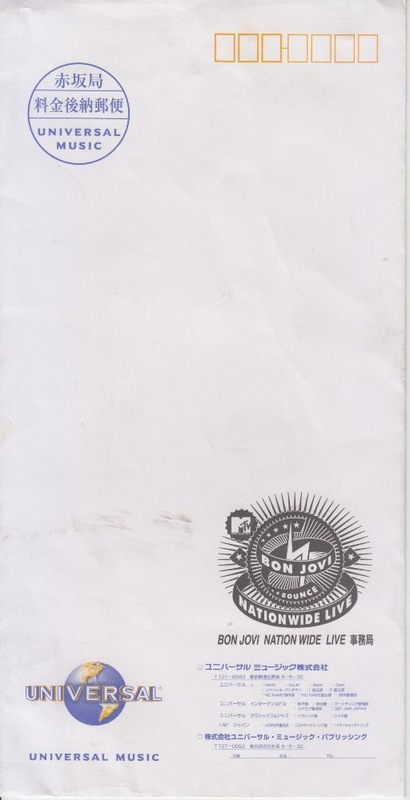 BON JOVI took place on September 11th, 2002 in Tokyo and all the invitation tickets live ticket. 1,000 people were invited from the album BOUNCE reserved by lottery. The second image is a notice sent with the ticket, the third image is the ticket delivery envelope.